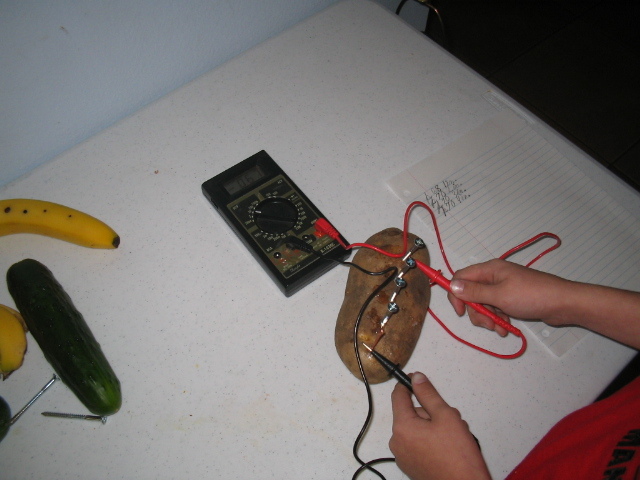 The reason of the test was to find out if fruits and vegetables can make electricity. 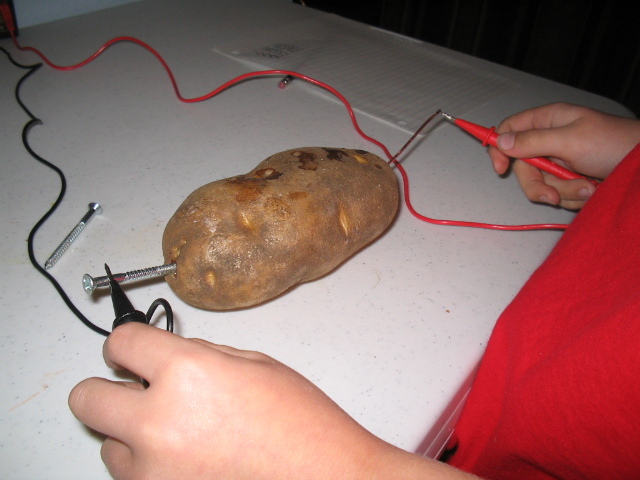 I thought that fruits would make a little electricity and that vegetables would make more. We began by gathering our materials. For the electrodes we used nails for steel. For copper we used an electrical wire. We removed the red plastic from the wire. For zinc we used normal screws. We got all of them from the garage. We got all the fruits and vegetables from a store. We got a banana, apple, lemon, orange, cucumber, carrot, potato, tomato and a lime. We also used an electrical meter, a battery, a ruler, and sandpaper. This is how I did the experiment. First I started out by getting an electric meter. Then I got zinc and copper electrodes put into a banana one inch apart. Then I got the electric meter and measured the electricity in the banana. Then I wrote the measurement down. Then I took the copper out and replaced it with steel and measured it again and wrote it down. Then I took out the zinc and replaced it with copper I already used. Then I measured it and wrote it down. Then I got an apple and did the same thing with the apple and the other fruits and vegetables. Then we had a question: Would a longer distance between the electrodes make more or less electricity? My dad thought it would be less and I thought it would be more. 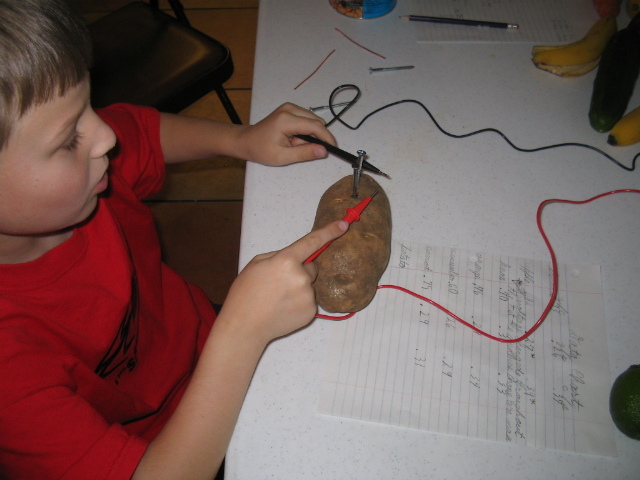 We tested it by putting 1 copper and 4 zinc electrodes in the potato with 1 zinc at 1 inch, 1 zinc at 2 inches, 1 zinc at 3 inches, and one zinc at 4 inches. Because of the distance test I wanted to test everything side to side. I used zinc and copper because they make the most electricity. To finish the experiment, we measured a nine volt battery. It measured 9.1 volts and we measured copper and copper in a potato and got 0 volts. 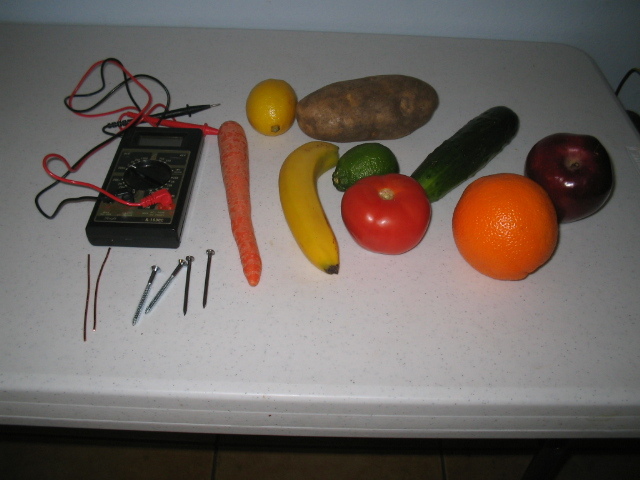 All fruits and vegetables that we tested can make electricity. 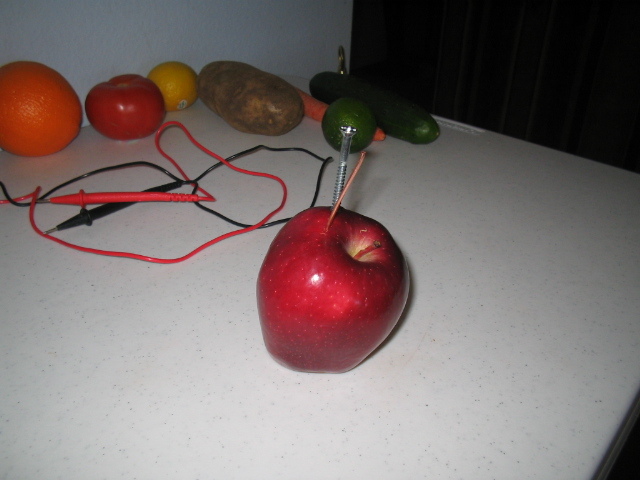 The electrodes react with the juice inside the fruits and vegetables to create electricity. The best electrodes are zinc and copper. The best fruit is an apple. The best vegetable is a carrot. The further apart the electrodes were the more electricity it could make. The best results were zinc and copper on opposite sides of an apple. If all the same size, the apple would be the best still.